...is the word you hear often when associates and competitors describe Charlie Kravetz, Station Manager of WBUR, Boston. 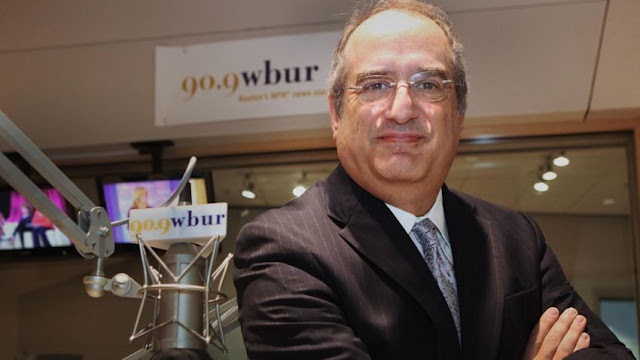 Now Kravetz and other WBUR managers are under scrutiny after last week’s release of an internal report [link] about the work environment at the station. 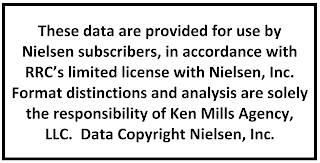 Boston University (BU), WBUR’s licensee, commissioned the study following the February 2017 firing of On Point host Tom Ashbrook. The report, done by Longpoint Consulting, consists of two sections: An online survey and then conclusions and recommendations by Longpoint. Seventy-two percent of WBUR’s 267 employees (including freelancer and interns) participated in the survey via SurveyMonkey. According to Longpoint’s analysis, WBUR is a flawed workplace where employees feel they are treated unfairly. The report implies that WBUR’s workplace is an “abusive work environment.” Longpoint called on WBUR’s management to make “substantive action” to improve the station’s internal climate. Eyes then turned to Charlie Kravetz, the person in charge at WBUR. Kravetz has a hard-charging style and is sometimes dismissive. But remember, Kravetz has spent most of this career in the news business where driven is the norm. At an all-staff meeting on Thursday (9/6) Kravetz apologized for his shortcomings and pledged to improve communication, accountability and oversight. He acknowledged his own “awareness of the impact of [his] leadership style on station’s workplace culture. Since release of the study, press reports have focused on the negatives in the Longpoint study. Though these are important issues that must be addressed, the employee survey generally paints a quite positive description of working at WBUR. We have visited WBUR many times over the years. The one word we would use to describe the environment is intense. The newsroom is staffed with high achieving, extremely talented individuals who are obsessed with doing their best work, often on deadline. Sure there are inflated egos and sharp elbows but these characteristics come with the territory. The news waits for no one and there is always pressure to succeed. Charlie Kravetz expects excellence and that is what he and the folks at WBUR deliver everyday. 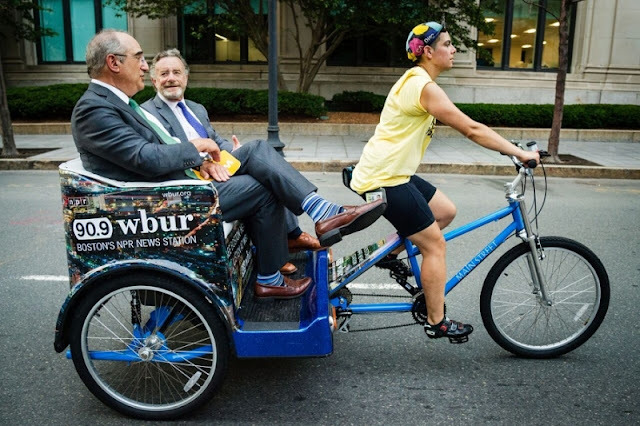 • 86% of the employees agree or strongly agree with the statement WBUR is a welcoming and friendly environment. • 80% of the employees agree or strongly agree with the statement At WBUR I have a clear understanding of the roles and responsibilities of the leader(s) in department. • 74% of the employees agree or strongly agree with the statement At WBUR I am recognized when I produce good work. • 74% of the employees agree or strongly agree with the statement At WBUR I have a clear understanding of the organizational/reporting structure of my department. • 67% of the employees agree or strongly agree with the statement WBUR has an environment that encourages a variety of thoughts and ideas. 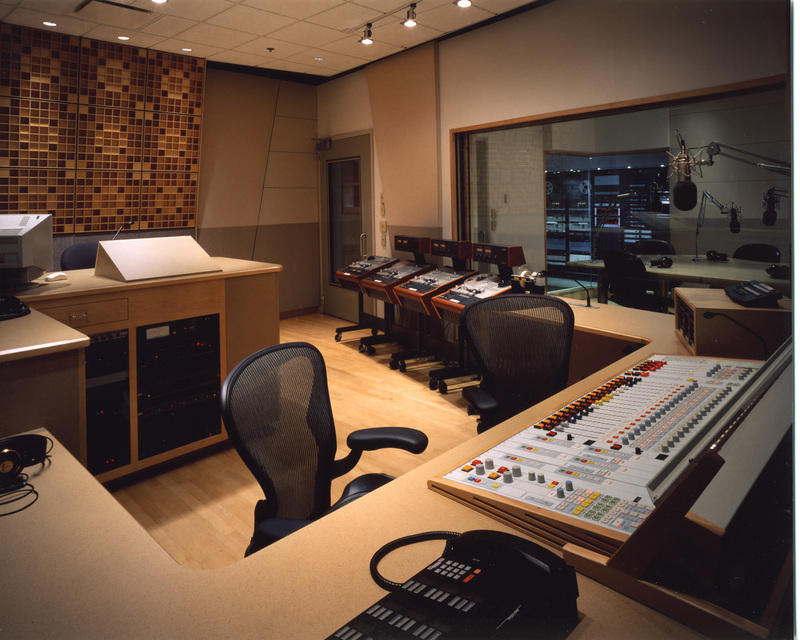 • 67% of the employees agree or strongly agree with the statement WBUR has a collaborative and cooperative environment. Boston University has engaged public media consultant Tom Livingston, to oversee implementation of the study’s recommendations. 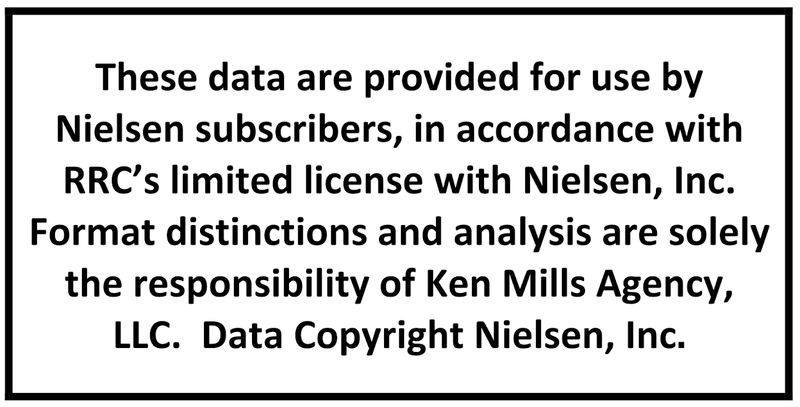 WRR had big gains in listening in August 2018 Nielsen Audio ratings. 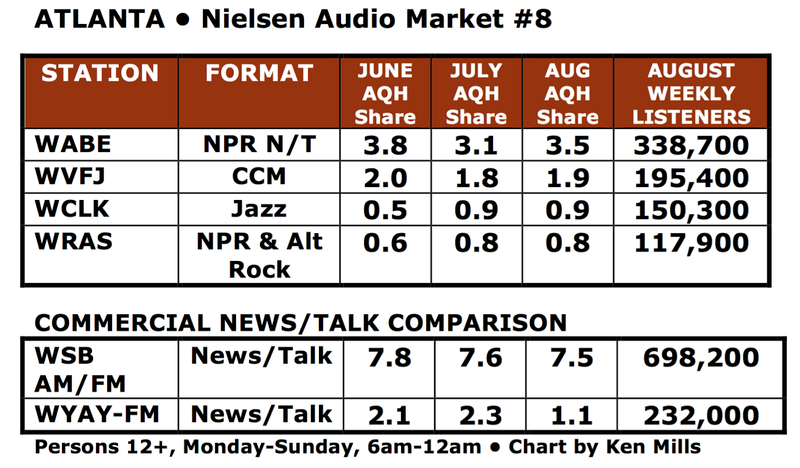 Not only did WRR’s AQH share rise a full point, estimated weekly listeners rose to their highest level in recent memory. 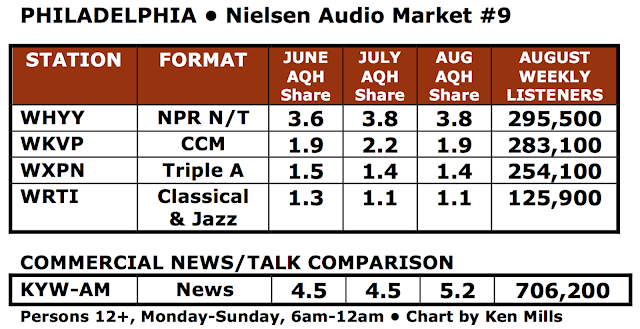 Classical music stations usually don’t achieve these kind of gains, so the folks at WRR must be doing something right. 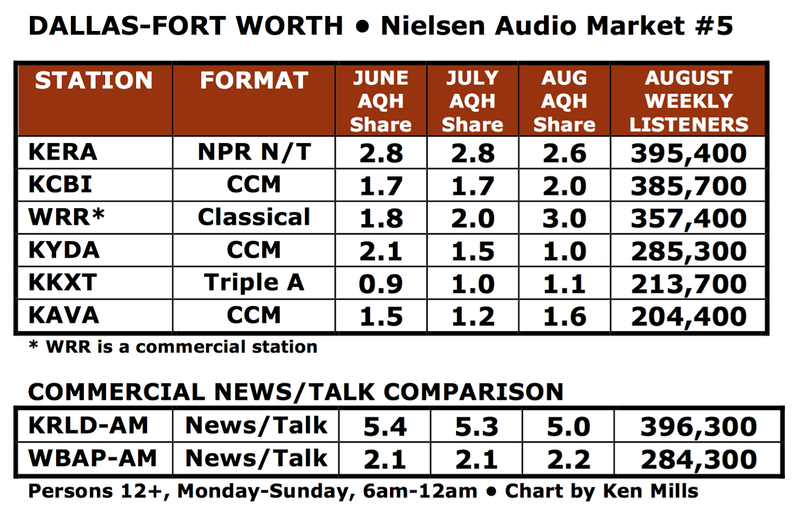 Also in Dallas-Fort Worth, NPR News/Talk KERA came within a whisker of being the top News/Talk station in weekly listeners. 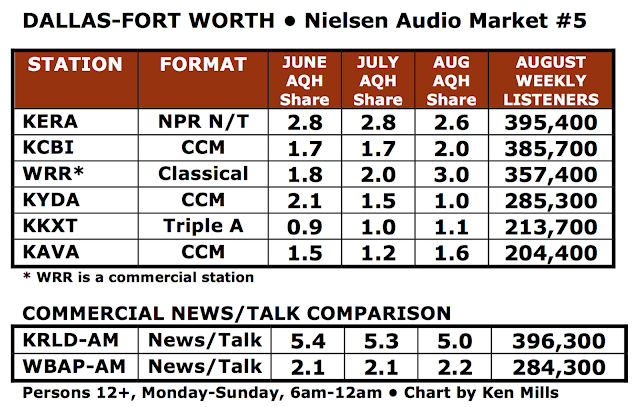 Heritage commercial news outlet KRLD has a much larger AQH share than KERA but the number of estimated weekly listeners is about the same as KERA's. WABE has grown its audience quite a bit sense they dropped Classical music Classical music as a second format several years ago. However, they trail WSB AM/FM for the top radio news spot in the August Nielsen Audio PPM ratings. WRAS, Georgia Public Broadcasting’s flagship station in Atlanta, continues to hold steady in estimated weekly listeners but keeps growing its AQH share bit by bit. One factor that is inhibiting WRAS is the dual format of college rock during evening and overnight. WHYY, Philadelphia saw its biggest drop in estimated weekly listeners in the August book in the past four years. However, WHYY’s AQH share remains strong. This means there are fewer people listening to WHYY in a typical week, but they are listening for longer periods of time. 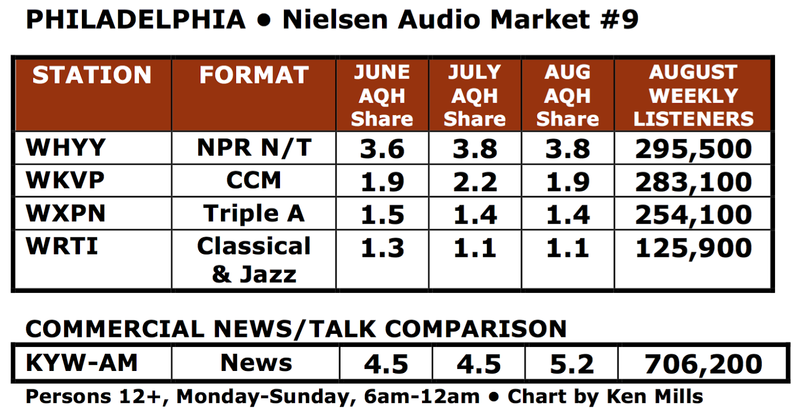 WHYY’s 3.8% AQH share puts the station closer to commercial radio news giant KYW. I take no position on whether or not WBUR's culture needs to change, but I think there's some interesting facts I can add to the discussion. I started as a work/study student at WBUR in 1996. I left a FTE employee in 1999. There are at least a half-dozen people who worked there when I started who are still working there today, in 2018. Probably more like a dozen or two. It speaks to how the culture obviously works well for some people. I've stayed in touch with many friends who still work there, and my impression is that the culture isn't all that different from when I was there. (well, after accounting for the usual societal culture shifts over the last twenty years) That tells me the original hard-charging, "we expect the best and demand the best because we are the best" culture is still there that was originally implemented by Jane Christo and very much reinforced by then-BU President John Silber. Silber was a brash, tyrannical egomanic, who demanded the very best and usually got it...and didn't care in the slightest whether your feelings were hurt. Now changing a culture at any company is very, very difficult under any circumstance. It's all the moreso when there's too much success, as WBUR has, to easily say "things need to change." So I'm not surprised that culture has persisted long after Christo's departure and Silber's death. And again, I can't say whether or not that culture DOES need to change. Finally, working at WBUR...even though I *was* a student, I didn't really feel like I was working for a college. I felt like I was working for a high-pressure news organization at the top of the game. That's great in some ways...it's like living in New York: if you can make it here, you can make it anywhere. Lord knows I learned things and earned credibility in those three years that still benefit my career today. 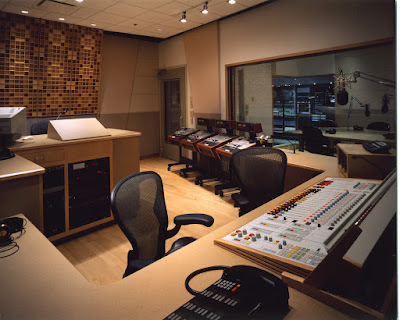 But having worked for radio stations at other colleges, where the college is much more involved, it does mean the staff can have culture shock when students DO come in as interns or student employees. What was the accepted norm ten or twenty years ago is legally-actionable behavior today...but since you're off in a walled garden of a successful news radio station, quite possibly you haven't been engaged enough with ins and outs of higher ed to see the culture gradually shifting over that time. That's not an indictment nor an excuse, just a potential explanation and perhaps a salient point in figuring out better "best practices" going further.